The Fifth Seal? Persecution of the Church? 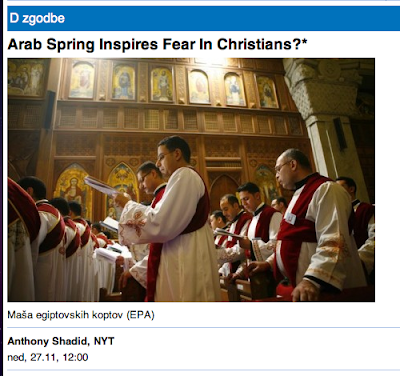 Top picture is the Thomas Dahlheimer article that wants to brand Christias as "eco-Terrorists." The bottom relates to Christian persecution in wake of Arab Spring. There could be similar fates for others in other regions as the "Occupy Movements" gather steam and supporters among the Mayan 2012 Calendar believers in the New Age networks. Our (USA) efforts to guarantee "democracy" in the Middle East have led to increased perils and persecution up to and including death in that region. I am indebted to correspondent Donald Hank for calling my attention to the latest disturbing news there. He says that at last the New York Times is reporting what he and others were watching and reporting with concern several months ago. There are moves among some in the Occupy Movement to harness UN and Native American support for a New Age earth worshipping religion. One New Age / Occupy Movement activist, Thomas Dahlheimer boasts that he is meeting with UN and other leaders. He would like to have Catholics in particular and Christians unwilling to go along with the "New World Religion" branded and treated as "eco-terrorists." Interestingly, his Christian bashing takes place this time in a venue (Nativenews.com) sometimes favored by Alex Jones. I would like to hear Alex Jones' take on Dahlheimer and his unmitigated Christian bashing! Dahlheimer's November 13th piece dealt with a proposed Wall Street GLOBAL Initiative (emphasis added). It is a global initiative to achieve world peace and ecological balance by, in part, influencing UN leaders and Occupy Wall Street to adopt the counter culture’s (or my) New Age Gaian – world view around the wordwahkon – earth saving and world unifying mission. The Catholic Church’s opposition to efforts to establish a one world government: In Pope Benedict XVI’s encyclical, Caritas in Veritate, he speaks directly against a one-world government. In paragraph 41, he says “We must promote a dispersed political authority.” He explains that “The integrated economy of the present day does not make the role of States redundant, but rather it commits governments to greater collaboration with one another…” In paragraph 57 he says, “In order not to produce a dangerous universal power of a tyrannical nature, the governance of globalization must be marked by subsidiarity.” Subsidiarity is a principle of Catholic social teaching which states that matters ought to be handled by the smallest, lowest or least centralized competent authority – as being essential. ref. Another "Occupy" venue for Dahlheimer's hate campaign against Christians. Click on picture to read full page and/or click here for link. Lee Penn and I have both wondered out loud if Mr. Dahlheimer had read our respective books and took everything we warned against as something positive and wonderful for the world. I don't know. My materials were compiled starting in 1981 by collecting these types of statements from New Agers. I frankly figured that if they had the nerve to say it, I had the nerve to quote it. Their weak flank was that they figured the "fundamentalists" would "never catch on" and if and when they did, "it would be too late to stop us." Well, they are clearly emboldened and on the march again. The Occupy Movements are an important component of where they are going. So is "global governance." Perhaps the Occupy Movements will add to the dialectics that make global governance appear increasingly necessary. At any rate as the New Agers approach their own apocalyptic deadline of December 21, 2112, I suspect that their activity momentum may well increase just as it was doing when they were emboldened on April 25, 1982 to run their half million dollar ad campaign proclaiming their New Age "Christ" was "now here." It may well be that whoever and whatever their candidate was then is still very much around, much longer in the tooth (as are so many of the New Age leaders such as Benjamin Creme, Barbara Marx Hubbard and David Spangler, I rather suspect they may view our crowd as career blockers. The Occupy Movements agendas contain items for "yoga classes" and "meditation". I am reminded once again of Marilyn Ferguson's New Age classic, THE AQUARIAN CONSPIRACY, where she bragged of a 'leaderless movement' that was "seeking radical change and they were "made kindred by their inner discoveries." They certainly are doing all they can to induce these "inner discoveries" (i.e. brainwashing) in the frustrated young people who think they are merely protesting the economy and their inflated tuition related indebtedness. I pray that those young people will like many in the 1980s discern the "hidden dangers" of their newest New Age rainbows in the form of this new accelerated "Occupy the World" movement and refuse to participate in the obvious anti-Semitism and Christian bashing increasingly apparent in that "Movement." 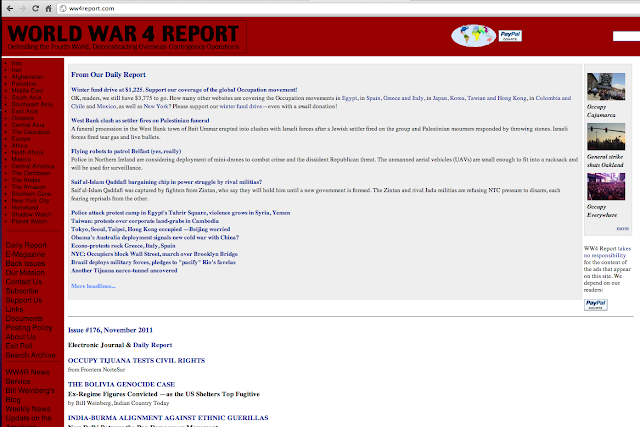 The New Agers see what is happening as "World War Four" -- Theosophist / Salvador de Madariaga student / World Citizens leader / Lucis Trust activist Rene Wadlow is connected with this "World War Four" site. We'd better start taking it more seriously ourselves! 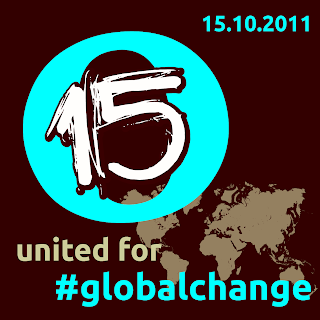 October 15th was an international "Day of Action" for the "Occupy Movements" around the globe. 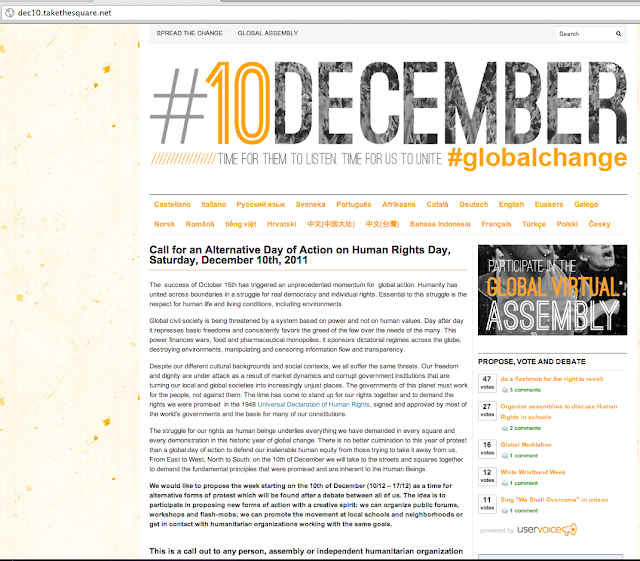 Looks like another one is planned for December 10th. As 2012 approaches and begins, I expect all of the "Occupy" movements to further broaden. OCCUPY WALL STREET -- "HERE TO STAY" -- DANDY EXCUSE FOR MARTIAL LAW, 666 SYSTEM AND/OR GLOBAL GOVERNANCE -- OR ALL OF THE PRECEDING? And now even "OCCUPY ANTARCTICA"
And now, even "Occupy Antarctica" -- for PAST MONTH! Today I did an internet radio program for Southwest Radio Church of Oklahoma City, Oklahoma about the "Occupy Wall Street" movement. Dr. Noah Hutchings introduced me by saying that this movement was spreading and if we didn't watch out, pretty soon it would be "occupy America" and then "Occupy the World." I had to gently tell him and his 3 man panel that we already had both -- "Occupy America" AND "Occupy the World." I then jokingly said that the only thing I didn't know to be yet "occupied" was the continent of Antarctica. And then, just now, I just found this! They're everywhere! I'm not sure when the SW Radio program will be available online, so check their website for information. I will be continuing coverage of this on my own internet radio programs on Tuesday and Thursday nights. Please tune in and Stay Tuned! Oh, and remember Rene Wadlow, an activist with Lucis Trust, the Theosophists, and World Citizens? He issued his own hoped for prognostication of the meaning of "Occupy Wall Street." It looks as if they may have BIG PLANS for next spring just as they did in 1981 and early 1982 when they ran ads saying "Expect the Christ in the Spring of 1982" and then on April 25, 1982 reading "The Christ is Now Here." I cut and paste quote verbatim. Click the past sentence to read it in the original. Is "Occupy Wall Street" New Age? Is the Pope Catholic? Do fish swim? Barbara Marx Hubbard's blogspot about her Occupy Wall Street thoughts and happiness! I will be posting much more here. I will be talking about this (OCCUPY WALL STREET as the NEW AGE WORLD REVOLUTION) on Dr. Stanley Monteith's radio program tomorrow at 4 pm Pacific time, 7 p.m. Eastern time. Sure looks NEW AGE to me -- the guerrilla street theater and all other communal life, meditative style experiential modes, etc., etc., ad nauseum.